When thousands of women converge on the United Nations today, March 11, they will have a singular focus: exploring the ways the world can move forward in promoting social protections that help women and their families live more dignified lives. 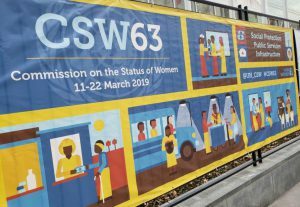 The 63rd annual session of the Commission on the Status of Women (CSW), the U.N.’s principal commission “dedicated to the promotion of gender equality and the empowerment of women,” comes at a critical moment in the history of women’s rights and gender equality, say Catholic sisters who plan to participate in the March 11-22 events. The role of the commission is to bring women together to promote the rights of women and girls and document “the reality of women’s lives throughout the world, and [shape] global standards on gender equality and the empowerment of women,” the commission says. The hope, O’Dwyer said, is to present and air the issues at the United Nations, pressuring U.N. member countries to initiate or continue work on gender equality to which they say they are committed. Events during the two weeks of meetings all in some way focus on how to empower women. For example, a March 14 event by the Congregation of Our Lady of Charity of the Good Shepherd focuses on grassroots empowerment work among rural Dalit communities in India. Also on March 14, the Society of Catholic Medical Missionaries and Sisters of Charity Federation will sponsor an event on transformative spirituality. The work of sisters and other women during the meetings is one kind of advocacy. The other is following up within the countries promising to do more to support and help women: Sisters, other women and those working in grassroots organizations pressure governments through advocacy work, whether by meeting one-on-one with government officials, conducting media campaigns or involvement in public demonstrations. Sr. Eileen Reilly, director of the School Sisters of Notre Dame’s U.N. office, said one reason the issue of social protection is coming to the fore this year is that in so much of the world, the work of women and girls — particularly the “care” work of family and households — is not paid and therefore is not recognized in terms of pensions or other societal recognition. So when a catastrophic event occurs, such as the loss of income because of a death of a breadwinner, women and girls who have done unpaid care work are often “left behind” with no means of support, she said. Sr. Janet Kinney, a member of the Sisters of St. Joseph of Brentwood, New York, and the executive director of the Partnership for Global Justice, a U.N.-based advocacy group, agrees with Reilly. “All of the unpaid work women do is significant,” she said, and needs to be more fully recognized in debates about work and anti-poverty protections. Maryknoll Sr. Marvie Misolas, representative of the Maryknoll Office for Global Concerns at the U.N., said in her country, the Philippines, government austerity measures are resulting in cutbacks of social protections, like pensions, hitting already-struggling families, particularly those headed by women. “Burdens like that always fall on women,” she said. Sr. Elsa Muttathu, who represents the International Presentation Association at the United Nations, praised the Commission on the Status of Women’s attention this year on social protections, noting it sharpens the United Nations’ focus on eradicating global poverty and other social ills by the year 2030 through its 17 sustainable development goals. But this year’s themes also focus on the growing consensus by advocates at the United Nations that those who need social protections need to claim them as a human right — “a right-based perspective,” she said. “We need systems that protect people from going too far into poverty: public health services, education, infrastructure, maternity care,” she said. Muttathu grew up in the 1960s in the southwest Indian coastal state of Kerala, long governed by leftist political parties that, despite national and global trends of cutbacks to government-provided services, continue a commitment to social protections. Muttathu recalls government-run health services and school programs like subsidized bus passes.